Despite the fact that he hasn't yet reached the age where he'd be receiving a five year high school reunion invitation in the mail, even Zac Efron confesses that if he had the chance to be seventeen again he wouldn't do it. While it's hard to imagine that somebody who looks like a walking Gap ad would have felt awkward in high school, I'm assuming you could attribute his reluctance to the fact that Efron is most famous for spending a good majority of his career onscreen in that exact environment whether it was in Hairspray or the internationally successful High School Musical series. And sure enough, in 17 Again, there Zac is again in high school and although the beginning of the movie directed by Burr Steers is set in 1989, when he dribbles a basketball and dances around, we start having HSM deja vu. However, the film is not Disney and G but Warner Brothers and PG-13 for a reason as we learn that Efron's star basketball player Mike O'Donnell has impregnated his girlfriend Scarlet. 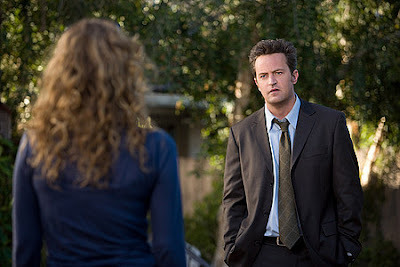 Walking off the court at the start of the game and the film to go after the girl he loves instead of impressing college scouts with his athleticism and chance at a scholarship, Efron's Mike evolves over the course of twenty years to become the bitter thirty-seven year old walking bummer played by Matthew Perry. A chronic complainer who is dissatisfied with his lot in life, when we're acquainted with the adult version of Mike we discover that he's unable to connect with his now high school age son Alex (Streling Knight) and daughter Maggie (Gossip Girl's Michelle Trachtenberg) and that his marriage to the understandably frustrated Scarlet (Funny People's Leslie Mann) is quickly approaching divorce. And as he's essentially regretted every move he's made since he walked off that basketball court to follow Scarlet, Bringing Down The House screenwriter Jason Filardi falls into an unfortunate trap by making Mike an amazingly unlikable guy right from the start. Thus, by presenting us with the stuck-in-a-rut sad sack who Matthew Perry tries to humanize the few minutes he's onscreen, we realize that no matter how much Efron does later in the movie, it's going to be hard to root for this guy. And it's especially problematic since he's given a misogynistic subtext by stereotypically blaming the girl for the pregnancy instead of thinking about what she's given up as well. Still fortunately, we don't have to deal with adult Mike for very long as 17 Again stumbles into a body transformation construct when Mike is granted the opportunity to become age seventeen again for a chance at a do-over except it's not 1989 but now 2009. While it's definitely a formulaic retread of the far more enjoyable films Freaky Friday, Big, and 13 Going On 30 with a few of the elements of Never Been Kissed and The Family Man added into this familiar concoction, it's Efron who ends up carrying the movie on his shoulders and adds an unexpected amount of warmth to the work. To this end, sadly about midway through the 102 minute movie I realized that the only time we felt that the character of Mike actually had a heart was when he was played by Efron. Obviously this isn't the fault of the most talented veteran of the Studio 60 on the Sunset Strip and Friends cast-mate Matthew Perry since he has so little screen time that basically his performance is a cameo but one that must've been present from the start in Filardi's screenplay. However, given this major of a detractor, Igby Goes Down filmmaker Burr Steers and his terrific cast are hampered before the movie even begins to play out but they try to distract us with enough charm, humor and magic to keep us watching. Luckily they manage to succeed in making 17 Again a likable diversion that is given a nice touch of sweetness in a wonderful supporting performance by Leslie Mann who continually fights against her undeniable attraction to Efron's Mike since he bears an uncanny resemblance to her soon to be ex as a young man. As Efron tries to spend as much time as possible with Scarlet to begin to see her side of the story, he similarly uncovers more about his children by becoming friends with them at school which leads to some strange encounters as his daughter (talented pro Trachtenberg) mistakes the new boy's friendly interest as attraction and tries to seduce the guy who's technically her father in a scene that will creep you out to no end. While Mann is arguably the movie's heart, the most consistent source of comedy can be found from actor Thomas Lennon (I Love You, Man) as Mike's wealthy computer genius best friend who reluctantly has to leave his life of Star Wars obsession and video games to pose as Mike's guardian and main ally who realizes that his friend has indeed transformed into his younger self. And sure enough although Reno 911! star Lennon gets the chance to deliver some of the best one-liners in the movie, his comedic success is doubled when he's paired onscreen with The Office's Melora Hardin who plays the beautiful principal that Lennon pursues nonstop which culminates in the strongest scene as the two unexpectedly bond during a dinner date. Still ultimately, as a movie, it's Efron's world and the rest just live in it which isn't a criticism per se since he does a great job. For, having been distracted by the gorgeous Blu-ray presentation of this Warner Brothers release as well as the annoying problems with the sound balance that unevenly distributed background noise, music, and dialogue in a way that found me constantly warring with the remote, I essentially missed out on Efron's Matthew Perry-isms during my initial viewing. Luckily these became far more apparent when taking in both the Zac-centric bonus material and when viewing key scenes the second time around. In addition to calling Perry to hear the talented man's line reading for some of his dialogue, Efron's preparation for the comedy went beyond just showing up with lines memorized and ready for the makeup and hair department to accentuate his chiseled features. As we learn in one of the special features, by studying old Friends episodes to grasp not only Perry's unique cadences, pauses, and intriguing choice of words in a given sentence he decides to emphasize along with his physical mannerisms and tendency to half smile/smirk and routinely put his hands in his pockets, Efron's dedication to playing Perry is far more intriguing given the fact that Perry's role is quite small. Likewise it makes 17 Again worthy of a second viewing on this basis alone just to catch and better appreciate the nuances you may have missed especially if you were as fixated on the difference in facial structure and appearance as some critics were in their reviews. However, those in their teens and tweens are wild about Zac so much that the 17 Again Blu-ray box is labeled "Packed With Zac! Over 30 Minutes More With Zac" since Warner Brothers which also produced the Emmy Award winning beloved Friends knows their core audience well. Nonetheless it was a wise choice made by Efron, producer Adam Shankman and director Burr Steers to pay homage to the adult version since he's not only more recognizable to a more diverse audience but it also gives Efron the chance to do more than dribble a basketball in high school a la HSM. And although I'm greatly looking forward to seeing Efron in the upcoming Me and Orson Welles since he finally leaves high school behind in the preview that precedes the Blu-ray presentation, basically, aside from serving as a nice showcase for Efron away from musicals, sadly 17 Again's tired screenplay that cribs from so many other movies in the genre feels like it would've been far more appropriate as a Disney Channel, ABC Family or made for cable original movie. Visually this Blu-ray marks a step up from some of the muted colors on display in earlier WB live-action releases like the recent straight to disc Spring Breakdown and additionally it boasts the cool and coveted (rare) WB bonus of a digital copy of the movie on a separate disc that doubles as a DVD, making it a 2-disc Combo Pack version of the 3-disc style ones consistently served up by Walt Disney Studios as evidenced in their previous Efron release High School Musical 3. As previously mentioned, the sound problems distract from the work and Mike O'Donnell's character is not one we're that interested in since aside from the need for a flawed hero who must grow and change, Filardi forgot to ensure he was at least likable. However with a terrific fan rewarding Combo Pack, Warner Brothers manages to keep you amused via a 203 pop-up fact track of behind-the-scenes gossip, '80s info and more along with a BD Live only Zac commentary, the Mac and PC compatible digital file, DVD version, and other extras tailor made for their core audience with this slim-cased budget friendly Blu-ray release.